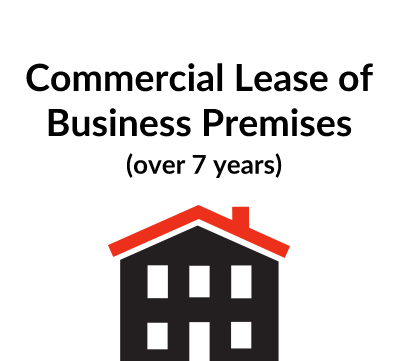 Who can use this commercial lease template? 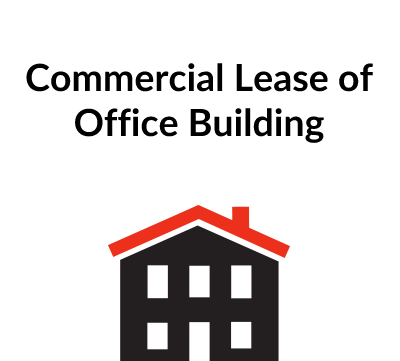 Any developer or owner of a commercial building who wants to grant a business lease. What is this commercial lease for? What are the main issues to cover in a commercial lease agreement? The term of the lease, the rent and when it will be payable, plus any provision for rent increase during the lease. Service charge calculation and payment also needs to be included. In addition, it sets out the obligations of both the landlord and the tenant with regard to maintenance and use of the building and the restrictions and procedure for subletting. For more details see our Explanatory Notes below. What detailed terms does this commercial lease agreement contain? It also includes the forms and wording required under the regulations to exclude the security of tenure provisions of the Landlord & Tenant Act 1954. 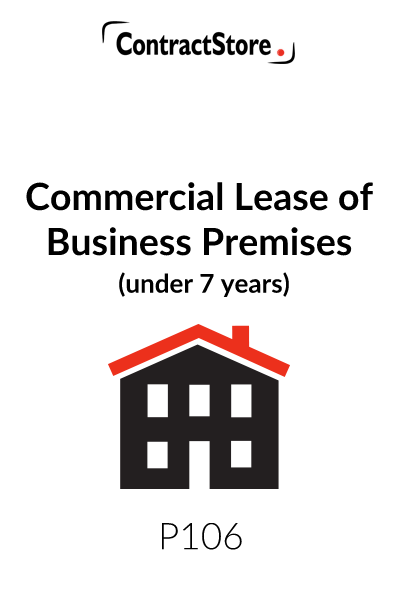 This commercial lease template is for use in England and Wales. ContractStore supplies templates and is not a law firm. But all our templates are written by experienced lawyers, in this case by a property solicitor. So we can arrange legal assistance for customers who need special terms in one of our documents or a bespoke template. . For more information see our Legal Services page. And if you want to contact us see our Contacts page. This form of lease is intended for use where a building, divided up into separate units, is to be let for commercial purposes – offices etc. Overall, this form is short as leases go but it contains the main provisions that appear in leases of this type. Though reasonably even-handed, it is generally landlord-friendly. The key legal effect of a lease is the grant of a leasehold estate. This is sometimes called a demise – the right to possession of the Premises for the term of the lease. Beyond this, leases create a number of other legal effects, including obligations to pay rent, obligations to maintain and specified remedies. Landlord and Tenant law is a complex area and legal advice is always recommended – both for landlords and tenants before entering into a lease. Before granting a lease, a landlord should make some checks on the prospective tenant – by obtaining references and by trying to satisfy himself as to the financial capacity of the proposed tenant. Although this lease does not contain any provision for a guarantee, it is not uncommon for a lease to a limited company, especially one which is owned and run by its shareholders, to require that one or more directors should personally guarantee the payment of the rent. 1. The condition of the Premises – the lease provides in clause 4.1.2 that the tenant has to carry out repairs. The tenant will not want to carry out repairs in respect of defects which existed before the Lease was completed, otherwise these could amount to improvements for the landlord’s benefit. The tenant should, therefore, survey the Premises and record in writing and perhaps with photographs what condition the Premises are in before completing the Lease. 2. Planning position – the tenant should ascertain that planning permission exists for the “Permitted Use” and it may also be advisable for the tenant to ascertain that Local Authority consents have been given for the construction of the Building. There may be conditions imposed by the Local Authority which will be binding on the tenant. 3. The landlord’s legal title – the tenant should ensure that the landlord is the owner of the Building and is, therefore, in a position to grant the lease. The landlord’s legal title may be registered at the Land Registry and, if so, a copy of the Register for the title should be obtained with a copy of the title plan. If the title is not registered, then the landlord may have to prove his legal ownership by producing copies of his deeds. In addition, if the landlord has charged or mortgaged the Building to secure a loan, then the consent of the lender will probably be required. There may be other questions relating to the landlord’s title and it may be necessary to seek legal advice on this particular aspect. Investigation of the title may also be useful in determining whether the Landlord grants the Lease in Clause 2 with full title guarantee or limited title guarantee. In England and Wales, under the Landlord and Tenant Act 1954, a business tenant is entitled to have his lease renewed at the end of the term except in certain specified circumstances, in particular when the landlord wants to redevelop the site. It is, however, possible to exclude the provisions of the Act so that the tenant does not have any protection. Until recently this involved an application to the court but new regulations were enacted in 2003 which avoid the need for a court order. These are covered in our form of lease –see the more detailed comments under clause 14, below. 1. An Energy Performance Certificate – the grant of most leases of commercial premises will require this certificate to be obtained under the Regulations unless a valid Certificate is already in existence. There are financial penalties for the landlord if the Certificate is not obtained when it is required. The landlord should speak with one of the qualified providers for advice and there are a number of web pages offering guidance. 2. An Asbestos Survey Report – most commercial premises will require this Report to have been done. The landlord may already have a Report for the Building. If not and a Report is required, then the tenant should ask the landlord to obtain one from one of the qualified surveyors. Again, there are a number of web pages offering information. 3. A Fire Risk Assessment – the Tenant should ensure that the Building including the Premises has been assessed and ask to see a copy of the Report. NOTES ON THE FORM OF LEASE. Details of the premises – e.g. “the premises comprising 100 square metres on the third floor of the building”. The term, i.e. duration, of the lease with the commencement and expiry date. The rent: this will normally be an annual sum and we have two alternatives – either inclusive or exclusive of service charges. Note also the wording in square brackets relating to a “rent free period”. Such provisions are occasionally agreed by parties e.g. where a landlord needs to let property in a ‘tenants’ market’ or where the tenant has agreed to carry out remedial work to the premises and insists upon a rent free period in return. 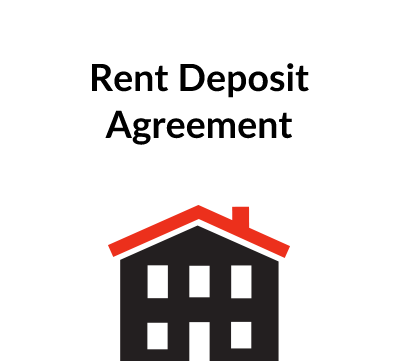 Deposit: this may be required by the landlord on signature and clause 3.5 deals with the deposit in detail. Rent review dates, for example, if there is a five year lease, it might be subject to review at the end of the second year and annually thereafter. Permitted use. The details need to be inserted here. Rights and Reservations. These are contained in the Schedule. Service Charge and Services. The wording needs to be tailored to particular circumstances and, in the case of the Services, it may be better to list them in the Schedule – hence the alternative wording. This sets out the basic agreement – namely that the landlord will grant the lease under the terms set out in this document and the Lease includes the rights granted with the premises, but is subject to rights reserved for the other parts of the Building. The Landlord will normally grant the Lease with the full title guaranteed. This implies that the Landlord had the right to grant the Lease, will do all the Landlord reasonably can to give a full title and, in the case of registered land, that the title is registered. In other cases, especially if the Landlord is a trustee, a limited title should be guaranteed. Legal advice may be necessary. It is usual for rent to be payable in advance in quarterly – i.e. three monthly – instalments and the details need to be inserted here. The first instalment may not be for a full three months and therefore this will need to be specified. Note the second alternate wording which will be suitable where a rent free period has been agreed. Clause 3.2 applies where the service charge is payable in addition to the rent. Clauses 3.3 to 3.5 make it clear that late payment of rent will entitle the landlord to interest and they also deal with the method of payment and the fact that the tenant cannot make any deductions from payments which are due. Clause 3.6 deals with the deposit where this is applicable. This clause sets out the basic rules to be adhered to by the tenant during the lease and includes such matters as keeping the premises clean, repairing any damage which is caused, complying with fire, health and safety regulations, and complying with the regulations governing the building which are imposed by the landlord etc. The use of the premises is restricted to the permitted use. Clause 4.2 deals with the charges for which the tenant is going to be directly responsible. These include the obligation to keep the building insured and in good repair and to provide other services, where applicable. Any alterations to the premises which are let will normally require the landlord’s consent and this is dealt with in clause 6. Clause 6.3 makes it clear that the premises must be reinstated into their original condition when the lease comes to an end. This deals with the procedure for agreeing a new rent and the possible appointment of an expert if there is disagreement. The name of the organisation to appoint the expert needs to be inserted in 7.2. This could, for example, be the Royal Institution of Chartered Surveyors. Where a rent free period is agreed this clause makes it clear that, for the purposes of the rent review, such rent free period is to be ignored. The landlord has the right to terminate the lease and recover the premises if the rent or service charge is not paid on time or if the tenant commits any other breach or goes bankrupt. 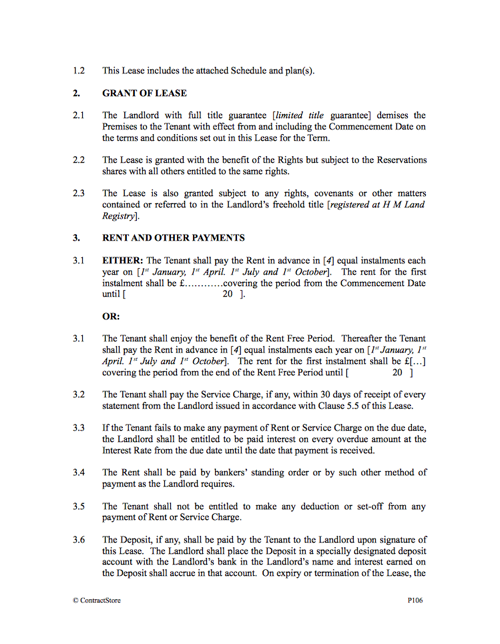 Note the alternative wordings in square brackets at clause 8.1.2 relating to the extent of a breach that will entitle a landlord to terminate. The precise wording will sometimes be the subject of pre-lease negotiations between the prospective landlord and tenant. If such a situation occurs, recovery of possession my not be as straightforward as the wording of this clause suggests and legal advice will be required by the landlord. Indeed, any signs of a problem with a tenant should be monitored and lawyers consulted sooner rather than later. The landlord should not attempt to take over occupation of the Premises or to evict the tenant without taking legal advice first. This would only apply if the property is damaged by an insured risk – in which the case the landlord’s insurance ought to be arranged so as to cover him for loss of rent. When the lease comes to an end, the premises must be handed over in the same condition as when the lease commenced (fair wear and tear excepted). Clause 10.2 provides a mechanism for resolving a dispute between landlord and tenant as to whether building/decoration works are required (or the nature/extent of any works required) at termination. A surveyor is to be appointed to determine whether works are required and if so the nature/extent of those works. It may be advisable for the landlord and tenant to agree a set of photographs of the premises as at commencement date so as to reduce the scope for dispute later and to assist a surveyor appointed to resolve any dispute. Note the suggested alternative wordings as to liability for meeting the surveyor’s costs. There is a restriction on both assignment and sub-letting. In spite of this clause it is always possible for the landlord to give consent should this be requested. The Lease is governed by the laws of England and Wales and disputes are referred to the courts unless they can be settled first. This sets out the procedure for notices which have to be served in accordance with the terms of the lease. Under the Landlord and Tenant Act 1954, a business tenant is entitled to have his lease renewed at the end of the term except in certain circumstances, in particular when the landlord wants to redevelop the site. It is, however, possible to exclude the provisions of the Act so that the tenant does not have any protection. Until recently this involved an application to the court but new regulations were enacted in 2003 which avoid the need for a court order and the parties can contract out of the relevant part of the Landlord & Tenant Act. 1. The landlord must give a notice to the tenant in a prescribed form at least 14 days before the tenant enters into the tenancy or becomes contractually bound to do so. 2. The tenant must sign a declaration in front of a solicitor or commissioner for oaths confirming that he has received the landlord’s notice. 3. The lease must refer to the above procedures as having being complied with and confirm that the landlord and tenant agree to exclude the security of tenure provisions in Sections 24 to 28 of the Landlord & Tenant Act 1954. It is in fact possible for the notice to be served less than 14 days before the new tenancy but if Sections 24-28 are to be effectively excluded the notice must still be given and the tenant must sign a statutory declaration in front of a solicitor or commissioner for oaths before the tenant goes into possession or becomes contractually bound to take up the lease. Clause 14.1 should be omitted if the landlord does not want to take advantage of the right to exclude Sections 24 to 28. Clause 14.2 excludes the operation of the Contracts (Rights of Third Parties) Act, the effect of which might otherwise be to give certain third parties the benefit of provisions in the lease. When all the details in the Lease have been completed along with the Schedules and plan, then the Lease should be executed by the Landlord. An exact copy should also be produced as the counterpart and this is executed by the Tenant. The Lease and counterpart should be dated as soon as the parties are ready for the Lease to be granted. The parties are then legally committed. A Stamp Duty Land Tax Return. by the Tenant and payment of any Stamp Duty Land Tax. The Tenant should refer to the web page of H M Revenue and Customs (www.hmrc.gov.uk/so/index.htm) to see what is required. The Return can be downloaded and then filed. There is a calculator to see if the Tax is payable. Registration of the Lease at the Land Registry. The tenant should refer to the Land Registry web page for further guidance and the forms which have to be used. A fee to the Land Registry is also payable. This does not apply for a lease of under 7 years.